Reduces the previous number of SMB 1.0 commands and sub commands from over a hundred to just 19 commands. Supports a new caching model called Lease. This model enables the client to have multiple opens on a single file which helps in holding on to the cache. 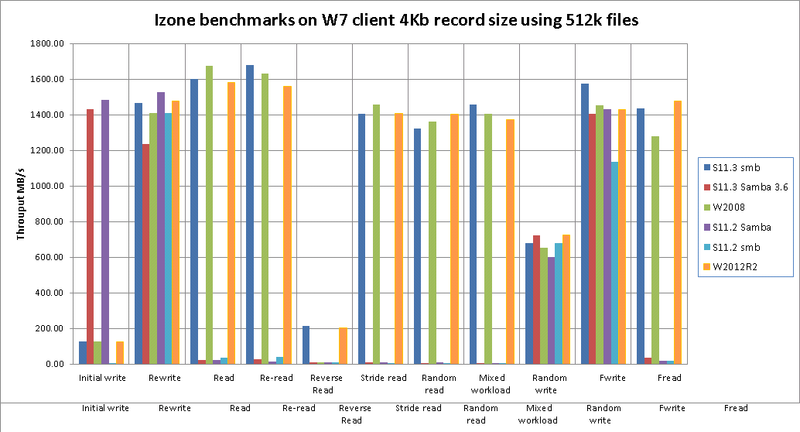 SMB payload requests can scale up to 1MB instead of 64K. Reduces CPU utilization on the server and client. SMB clients gain the performance benefit of not losing local caching when the same file is opened multiple times. 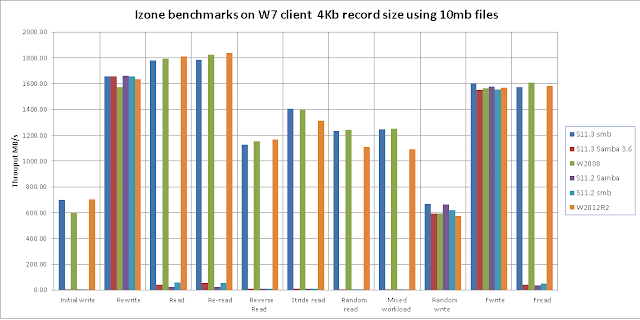 I decided to run some test on Windows 7 clients using IOzone Filesystem Benchmark to measure file performance (What you're really testing is your system's buffer cache + disk cache + disk speed combo) using a collection of different servers. It is no surprise that Solaris 11.3 with SMB 2.1 does give better performance, but it is good to see it. I should also look what is happening on the server during this time.